Blueberries, Art and Life: An Autumn Award! 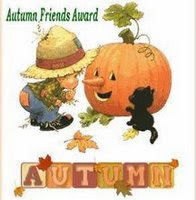 How nice to receive this adorable "Autumn Friends Award" from Rosie at Corners of my Mind blog... thank you so much Rosie! BLESSINGS!! Thank YOU!!!! and you so justly deserve it!! MISS YOU! Thank you. You are so sweet.